Expertly crafted from sustainable wood, not only are these turquoise wooden earrings stylish to look at, they are also a delight to wear - light so they will not pull on your ear lobes. 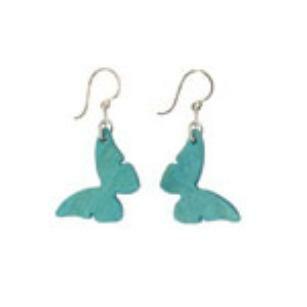 Bright and feminine, the Sinisiipi butterfly earrings will make a wonderful stocking filler for ladies of all ages who love bold wooden earrings. They are also great value too at only £12!